I think I mentioned in a previous post that most evenings there are at least a couple of people playing pool in the game room. Pool is actually a significant source of entertainment on station, and one of the most popular pastimes. 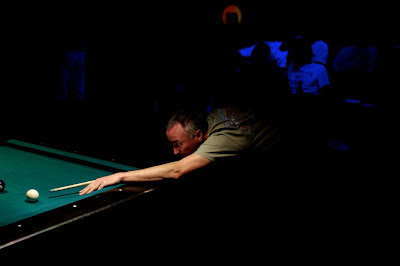 Since just after sunset, the yearly 8-Ball tournament has been pulling in crowds every Tuesday and Thursday. Its a place to go, have a drink, chat with friends, and of course poke fun at the competitors. I never really thought of pool as a spectator sport, but life at pole has certainly proved me wrong on that one. The finals were held just after midwinter, and enough people showed up to cheer that we had to call in the carpenters to build grandstands. Bleachers seem a little excessive when your entire social universe is limited to 59 other people, but I guess at this point in the season people are willing to do whatever takes to have a fun evening. And it was fun - the championship match was tight, and exciting to the end. Pool spectating is a surprisingly pleasant way to spend the odd weeknight. Hopefully the 9-ball tournament will start up soon. been reading your blog for a while, thought i'd say hi. maybe you could post some tips on the old cue and ball, as I for one am useless at it!